Although tea drinking was popularised in England during the 1660s by Charles II, afternoon tea did not become established until the mid-nineteenth century. Tea consumption increased dramatically during the early nineteenth century and it is around this time that Anna, the 7th Duchess of Bedford is said to have complained of “having that sinking feeling” during the late afternoon. At the time, it was usual for people to take only two main meals a day, breakfast, and dinner at around 8pm in the evening. The solution for the Duchess was a pot of (tea leaf, of course) in a china tea cup and a light snack, taken privately in her boudoir during the afternoon. The solution for the Duchess was a pot a tea with some small, filling accompaniments that would see her through until dinner time. Later, the Duchess friends asked friends to join her for “tea and a walking the fields.” Other social hostesses quickly picked up on the idea and the practice became respectable enough to move it into the drawing room. Before long, it became highly fashionable to enjoy the ceremony of afternoon tea. 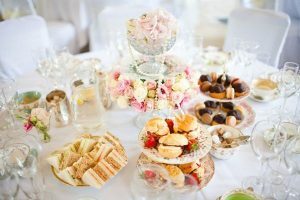 Afternoon tea was soon all the rage, and quickly became established as an important part of the day – performing the function of being restorative but also it was soon to become a convivial event where you could socialise. Nowadays, afternoon tea is the perfect option for a celebratory event – you can enjoy it with tea, champagne or prosecco and can theme it accordingly or opt for a more traditional version. Or email info@anisecatering.com. We can tailor any of our menus accordingly.